Crowns, bridges, and veneers maintain and restore your smile. Crowns strengthen weak or broken teeth by covering the entire tooth. 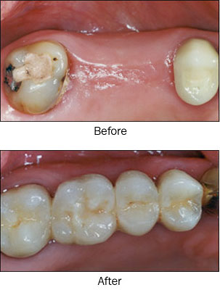 Bridges replace missing teeth to restore function and esthetics. Porcelain veneers, with minimal tooth reduction, can be bonded on the front of your teeth to close gaps, changing the color, size and shape of your teeth and correcting minor misalignment.